How effective is the Laser procedure? Current studies show a benefit in 89% of patient's nails. The laser treatment usually takes a few months before you begin to see healthy nail growth. What do I do to get my nails ready for treatment? You will need to trim your nails and remove all polish and lotions from the nail bed area the day before treatment. You may resume normal activity immediately following treatment. After treatment, it is recommended to wash all of your socks in hot water and wear new shoes or spray all of your shoes with an anti-fungal spray to reduce the possibility of reinfection. The Lunula Laser targets the fungus and stimulates new clear nail growth. This patented red and violet visionary laser delivers an innovative, multi-faceted approach of low level laser therapy in the form of two different wavelengths to the affected area. 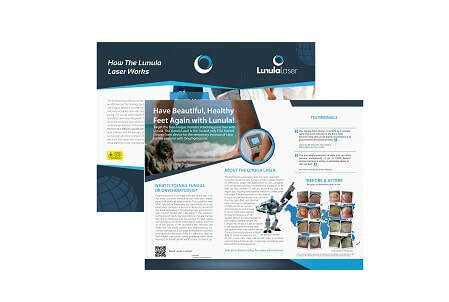 Likened unto the agnostic effect of a drug, the Lunula uses photonic energy to mudulate cellular reactions that target the fungus without any adverse reactions to the nail bed, toe or foot. No significant side effects have been reported. Treatment with the Lunula ‘Cold’ Laser is totally pain free.